Help seniors make a list (and check it twice) – It is always a good rule to be prepared before heading out to the mall to know what you are looking for and how much you are willing to spend. Offer to help seniors write down what they want or need to buy and then focus on going to stores that most likely will have what they want. You may need to help seniors track what they have purchased and what they have spent. Shop early and during the week – Malls and smaller shopping centers are least crowded during times when most people are at work or at school. Take advantage of this by timing your trip to start well before noon and try to end right before (or perhaps after) lunch. Shopping can tire anyone out so keep it short and maybe take two or three trips before Christmas to break up the chore. 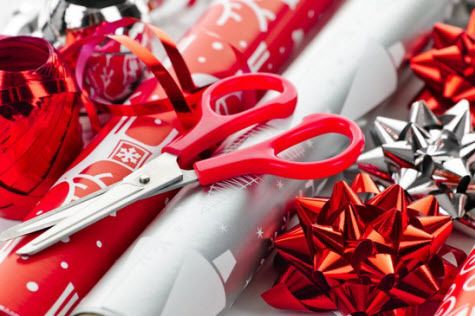 Take advantage of gift-wrapping services – Many stores or malls have free or low-cost gift wrapping during the holidays. Seniors who may have some physical limitations may appreciate having this job handled by someone else. Just be sure to label each box immediately and keep track of what is in each wrapped box so you don’t forget anything when the big day arrives! See the sights – While you are out and about with a senior citizen, be sure to make one or two stops simply to enjoy some holiday decorations and perhaps some caroling. Malls and downtown spaces are often dressed up early in the season and offer special touches such as singing, music and cocoa. packages arrive well before Christmas. If the senior citizen lives in a retirement or assisted living community, be sure to check the activity calendar to see if they are hosting any in-house craft fairs, bazaars, or other events that might be good for holiday gift or clothes shopping. These types of events are the most convenient and are usually a lot of fun (with plenty of cocoa, music and friendship). Holiday shopping with seniors can be fun and enjoyable – and can add to all the wonder of the season!